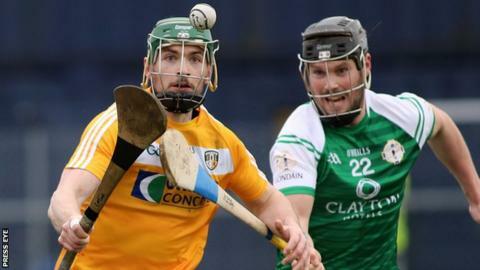 Antrim got their Division 2A Hurling League campaign off to a winning start as 10 points from Ciaran Clarke helped them see off London 0-20 to 0-13. The Saffrons led 0-9 to 0-6 at half-time at Corrigan Park and six unanswered points after the break put the game out of London's reach. Seven of Clarke's points came from frees while Conor McCann hit 0-3. Jack Sheridan's last-minute goal helped Kildare beat Armagh 1-18 to 1-15 in their Division Two A contest. Armagh led 1-7 to 0-9 at half-time at the Athletic Grounds. In Division 2B, Down were hammered 4-21 to 1-10 by Christy Ring Cup champions Meath at Navan with Kevin Keena, Sean Quigley, Adam Gannon and Anthony Forde getting the home team's goals. Derry, meanwhile, got their Division 2B campaign off to a winning start as they edged out Mayo 1-14 to 1-13 at Castlebar.